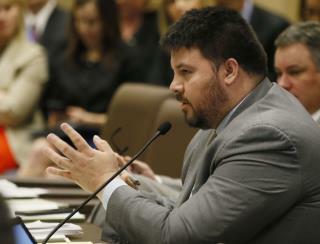 (Newser) – On Wednesday, Oklahoma state Sen. Ralph Shortey was suspended for "disorderly behavior." On Thursday, more details emerged as Shortey was charged with three felonies involving child prostitution, the Oklahoman reports. The charges came out of a police bust on March 9, when cops say they found Shortey at a Super 8 motel in Moore with a 17-year-old boy in a room stinking of pot. An investigation was kicked off after the boy's girlfriend called his dad, who in turn contacted the authorities, per the Tulsa World. Police say they came across a text on one of the teen's devices that indicated the boy was looking to make money for spring break, to which they believe Shortey, using a screen name, responded, "Would you be interested in 'sexual' stuff?" Say what you want libs. Hillary got people killed and Bill is a frequent flyer on the Lolitta express! You mean he's a family-values, Red State Republican? I'm shocked. Shocked, I tell you. /s The fact that he's charged with "engaging in prostitution within 1,000 feet of a church" is deliciously amusing and ironic, isn't it? He probably ran against his Democratic opponent by calling him a sodomite. Black eye for republicans. Dang!! He wasn't even doing it with a female, for crying out loud. Burn him at the stake. No jury, no trial, no excuses.